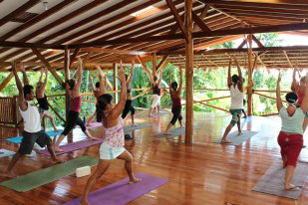 On Costa Rica’s southernmost Pacific coast The Yoga Farm, which is a rustic yoga center, is located.This remote area of Costa Rica is regarded as one of the most biologically, geographically and culturally diverse places in the world. 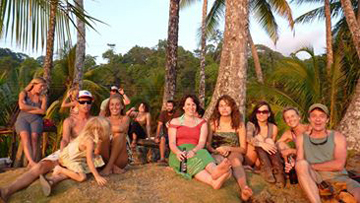 The Farm is set in the hills overlooking the beautiful empty beaches of Punta Banco and also surrounded by coastal rainforest, patches of farmland, and the Guayami Indigenous Reserve. If you want to see and abundance of wildlife you will get plenty of opportunities to have this experience with local guides during the time you will stay at the Yoga Farm. This Yoga farm will help you to reconnect your mind, body and nature. On the farm there is an elaborate rain-water and spring-fed water system provide for water needs. 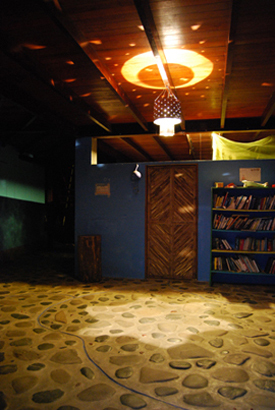 The yoga farm is powered entirely by solar energy. It has small flock of free range chickens gives a bountiful supply of eggs.It also has a horse named Momo which helps keeping CO2 emissions low by carrying provisions to the farm. Staffs of the farm take care for the vegetable garden and fruit trees organically. The buildings of the farm are built with natural materials in an architecture that eliminates separation from the natural beauty around. You can relax and play on a beach which is free from crowd of tourists. You can take as much time to yourself as you like. During lunch time you can have local fare lunch or can chose from two healthy, primary vegetarian meals provided by the Yoga Farm each day. There are two fresh water springs that provide crystal clear drinking water. There are also abundance of fruit trees and plant inherited by the Farm and it aims to add harvestable amount of plantlife on the property every season. You will get the opportunity taste different types of fruits including many bananas, varieties of mango, papaya, pineapples, jackfruit, coconuts, guanabana, anona, citrus, water apple, starfruit, cacao, herbs, peas and beans etc. The Farm has a plan to add a small tea garden. 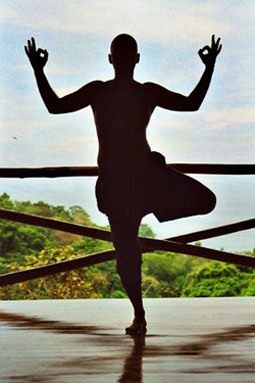 The Yoga Farm provides simple and comfortable accommodations for every guest. The main house of the farm is a large two story building with wood-floored yoga deck, beautiful view of the ocean from the open air. On the first floor you will find guest houses with amenities, communal space and also a hot-stone sauna.There are two private cabins ( with a more personal environment) which can be provided for individuals or couples only upon request. From these cabins more wildlife can be seen. There is newest cabin in particular looks out upon a beautiful forested valley. Kitchen is set apart from the main building. The Yoga Farm love to host workshops at the Farm The workshops held in addition to daily activities at the farm. Every guest can join the workshops if they wish but it is not mandatory for all. Workshops include anything from yoga philosophy to birding to break-dancing. You can enjoy the workshops if you go with a group but keep in mind that all of the group members will have to make an individual reservation through online reservation system. If you are an instructor/organizer and want that your favorite student attends your workshop then you should ensure that they already made a reservation. The Yoga Farm is a place for people who want to be surrounded by breathtaking nature, practice yoga, eat healthy food,enjoy the beach, hike the forest. This farm works for developing a more sustainable way of life through permaculture based design and land use.